Which color do you like? Colleen has already shown us the turquoise and everglade. @emmysmom - I too like the Everglade color. Also the black. The leaf jacket is a TDO and will be presented tonight on the final shows. Glad to see it reordered! I would like to buy it if pricing is reduced in the future. 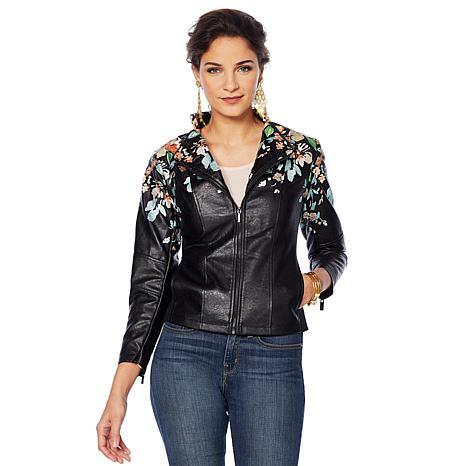 i bought the weave jacket in black - good price at $40. Not sure if I will buy anything else. Anyone else shopping? I purhased a couple of MW pants...they were both around $23....couldn't resist...one went on waitlist as I was buying..so I got another color...! 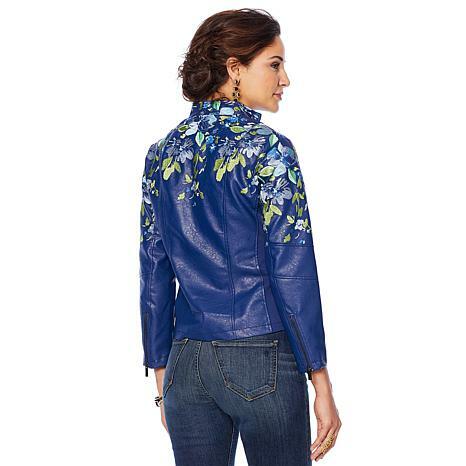 You got a great deal on Colleen's jacket! 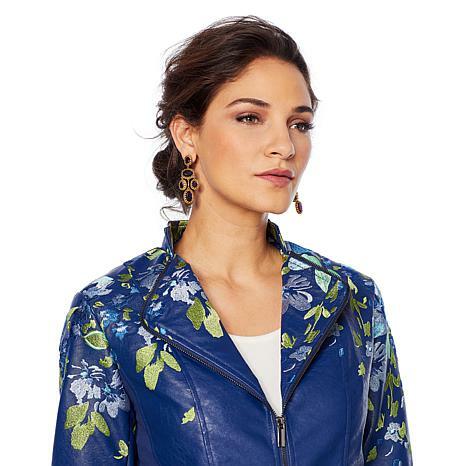 Would love the leaf jacket...but like you...I'll wait for a markdown! @emmysmom - I would have loved those Marla side zip jeans in white, but I missed it. $10 is a craxy good price. Hope you love your goodies. Yes, that leaf jacket is so chic but it's a total fashion item - not for warmth lol so I will wait. I think the new blush color will be a hit. Yes..the leaf jacket definitely NOT for warmth...lol! Can't wait for G's return..finally! We got ice and snow last night...are you snowed in too??? This has been a rough winter! Looking forward to Spring...! @Chi-town girl@emmysmomI do like that leaf jacket but think I would prefer it in black. It is very unique looking. @emmysmomYes, I have been having health issues this summer. Finally found it was probably a stomach bacteria causing everything but trying to get rid of it has been worse than the original problem. I have lost 25 pounds since the summer just because I have not been able to eat much. I am doing better but not back to where I was before this whole thing started. I have to go back in a few weeks for another test. Glad to have finally gotten some appetite back but hope I can keep from gaining back the weight. I really need to keep it off. The bad thing is that a lot of the clothes I had bought are too big now, especially the tops. Wearing my flatter fit pants today, those are really the pants that are fitting me the best now and I can still wear those Iman ankle pants I stocked up on but a lot of my other ones are too loose now. Is there any kind of guarantee that if I buy the navy jacket I can also look like that beautiful model in the picture above. She is really beautiful. She makes anyone want the jacket. I'm so sorry you've been so sick! Praying this bacteria is gone!! When I first got diabetes, I lost too much weight. I weighed 85# and gave my fav Coldwater Creek jeans away! They were the soft, stretch denim...I gained the weight back and the jeans would have fit! They were too $$ at the time to replace. I would keep your larger clothes..just in case you put on a few pounds! When u find your perfect weight..maybe you can have them adjusted. (I still have 3 different sizes..just easier that way...lol!) Thank God your pants still fit, easier to replace the tops! They're cheaper too. Iman says...you only need a couple pair of pants...and several different tops...I'm trying to do this. Oooooh I caved last night when I saw the leaf jacket presentation.. Bought it in black. I need to check my orders for free ship since I thought it was only for clearance once you hit $75 but Colleen and Amy said it was free ship for $75 of all fashion. 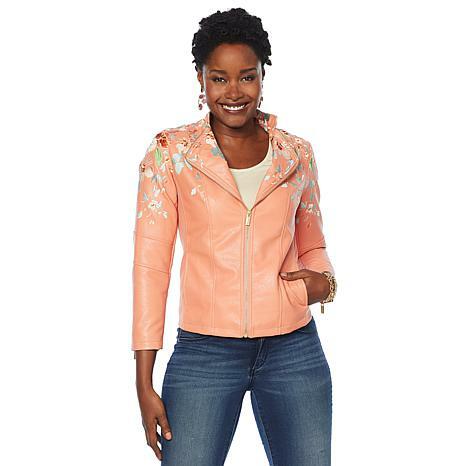 Amy asked Colleen to reorder the leaf jacket again and offer it in metallic like rose gold. Ummm yes, please. I will post reviews of my orders.